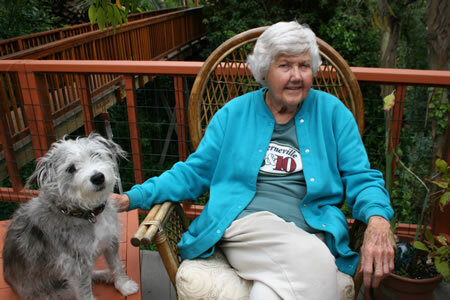 Ann Wood and her companion, Stanley. Wood, who has been serving the community of Laguna Beach in a myriad of capacities for more than 40 years, is the Woman’s Club Woman of the Year. A luncheon celebrating Wood and her contributions to the well being of countless people and community organizations will be held on Friday, June 1, at 11:30 a.m. at the Woman’s Club at 286 St. Ann’s Drive. All are invited to attend. The theme “Love through Service” has informed Wood’s actions in the world since she was a young girl and has resulted in her being bestowed with a quiver full of accolades. For the major parts she played back stage at the Laguna Playhouse from 1968-1993, Wood was named a lifetime member. In 2005, she won the Exchange Club’s “Book of Golden Deeds,” an award given to a volunteer for their outstanding community service. Describing herself as a “Community Volunteer” on her business card, Wood has also served on the Patriot’s Day Committee, Town and Gown, a support group of her college alma mater, Chapman University, and past president of Delta Kappa Gamma, a national society that recognizes outstanding teachers. Since 1972, Wood, who will be 80 in June, has lived in a cabin like cottage near Oak Street Beach. Soon after she moved to Laguna in 1969, a constant focal point of Wood’s energies – and a foundation for her charitable work – has been the Neighborhood Congregational Church. Wood has held numerous positions at the church including moderator of the congregation and is currently chairman of the deacons, a group that offers spiritual support to the minister and outreach to people who are in need. “I like my outreach to be connected to justice,” Wood said, which dovetails with NCC’s efforts such as providing meals to local homeless people or shipping plastic bags to Nicaraguan women who crochet them into purses. Wood’s unquenchable drive to serve began early. It fueled her career as a teacher and was nurtured by her involvement in various churches. As a young girl growing up in Sacramento, Wood would walk herself to the local Christian church, often taking along with her the neighbor girls she babysat. By the time she was in junior high, Wood was teaching Sunday school and spending the summers as a counselor at church camps. Though her father was a chemist who wanted her to attend a secular university, and her mother, a playground supervisor and election officer that only attended church with her daughter on Mother’s Day, Wood was true to her inner guide and chose to attend college at a Christian school, Chapman. After graduating, Wood returned to Sacramento to teach “and pay back her parents” for tuition. In her four decades as a teacher, Wood’s assignments included teaching as a civilian with the U.S. Army in France’s Alsace Lorraine region, close to the German border, and four years in a divided Berlin. Atop a “viewing platform” on the west side of the wall, Wood still tearfully remembers watching a young couple lift their tiny newborn into the air and in the distance seeing a waving white handkerchief, held by the baby’s grandmother, denied the joy of holding her grandchild. When she retired in 1993, Wood’s time was quickly consumed by the infamous firestorm that struck her hometown. The commitment lasted over two years and ultimately ended in the creation of Resource Center, which to this day provides services and goods to families and individuals in need. Despite recent health challenges, Wood considers “cope” to be a four-letter word. She continues to assist community organizations, volunteering weekly to answer the phone at the Friendship Shelter. While she never married or had children, Wood has always had a canine companion. Now, she has Stanley, a part Australian shepherd, part terrier, or “terror,” Wood said, which she rescued. Honoring a Woman of the Year has been a tradition of the Woman’s Club since 1995. Tickets to the catered luncheon and program to celebrate Wood and her accomplishments are $30 for guests and $25 for Woman’s Club members. Please mail or drop off a check by May 29th to reserve a seat. Any questions please call (949) 497-1200 or email [email protected]. Robin Pierson is a Laguna Beach writer.